Find out about Thomson / TUI hand luggage, hold luggage and excess baggage fees. You don't need to restrict your luggage when you go away on holiday with Thomson/ TUI. 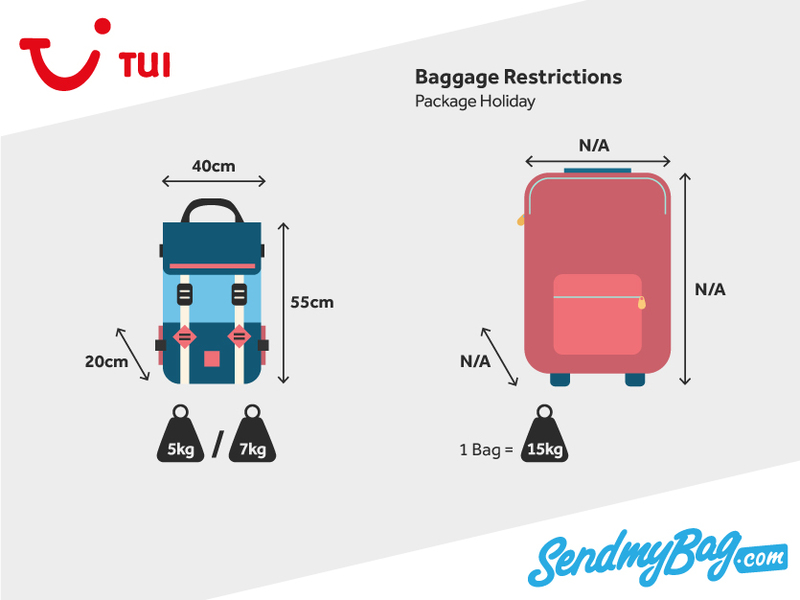 You can bypass Thomson/ TUI's baggage restrictions by shipping your luggage to your destination with Send My Bag. You can send it to your hotel reception so that it is waiting for you on your arrival. This means you can bring as much luggage as you like without needing to drag your luggage behind you. You can simply sail through the airport instead! Get a free quote now. The Thomson / TUI hand luggage allowance on package holidays is one cabin bag that does not exceed 5 kg and that does not measure more than 55 x 40 x 20 cm. This allowance increases to 7 kg on some package holidays. On flight-only bookings with Thomson / TUI the hand luggage allowance is always one 5 kg bag. All items such as handbags, laptops and duty-free purchases must fit within this one item of hand luggage. Premium Club members may bring on board a 7 kg cabin bag. Musical instruments can only be brought on board if they fit within the standard hand luggage allowance. An extra seat cannot be purchased for larger instruments on TUI flights. Blunt items that could be used as a weapon, such as baseball bats. When travelling on a Thomson / TUI package holiday you may check in one 15 kg bag, or 20 kg on certain itineraries. Premium Club members can check in 23 kg of hold luggage. Flight-only passengers must purchase a checked baggage allowance, which is cheaper online than at the airport. All passengers travelling on the same booking may pool their baggage allowance, as long as no one bag weighs over 23 kg. Children under two years of age are given a 10 kg baggage allowance. Excess baggage fees will be charged if your baggage exceeds your checked baggage allowance. The fees range from £13 (€17) to £18 (€27) per kg of excess baggage, depending on the season you are travelling in and whether you are on a short, mid or long haul route. Thomson / TUI insists that you let them know by telephone (0203 451 2695) two months in advance if you intend to bring sports equipment with you on your flight. Sports equipment must be pre-booked onto your flight. Note that divers who show their diving certificate at check-in will be given an extra 5 kg allowance for their diving equipment, free of charge. 5 kg; 55 x 40 x 20 cm. Looking for Thomson/ Tui sized hand luggage?